A braai is so much more than just grilling up a quick meal. It starts with your fire and ends with a perfectly cooked meal. Having a chop, potato, and tomato on your plate is simple yet satisfying (anything that includes a chop is satisfying). 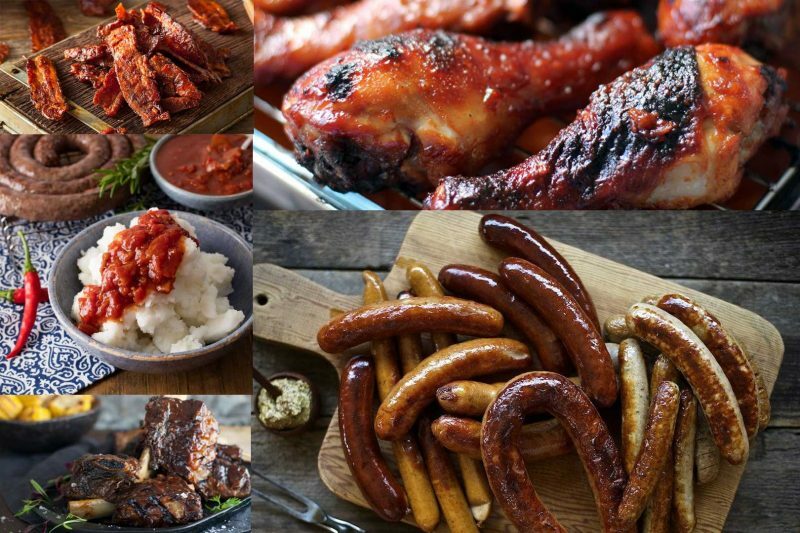 We gathered some meat braai ideas for braai masters who like to experiment and use creativity to enrich every braai experience. Marinating meat the night or a few hours before cooking enhances the depth of flavors and preserves meat moisture. Buy meat in bulk and freeze in marinated portions. This is a big cost and time saver for the party next weekend, or simply keep it on hand for those spontaneous mid-week braais after work. Before adding meat to the grill, shake off excess marinade and allow it to stand until it reaches room temperature. That grill you’re about to use must be clean. Cooking off old grid grease onto fresh meat is not only unhealthy but will ruin the food with oil and grit. Meat also sticks to dirty grids so use a fresh, raw onion or lemon to scrub it down while it’s on the fire. The success of any braai begins at the butchery and grocery store. You’re not supposed to transform bad chops into good chops, you’re supposed to braai good meat to perfection. Start with good quality food for your braai choice. The meat you choose determines the herbs and spices, preparation and cooking time, and what braai techniques to use. When researching recipes and meat braai ideas, you can adjust everything for braai’ing (forget the oven or pan). Pork is a thin, lean meat that cooks fairly quickly and can dry out as quickly. They’re at their best when marinated, basted, and seasoned. Braai’ing pork shoulder and pork neck are fattier, juicier alternatives. Lamb chops over a fire. An unmistakable braai aroma, known to cause hyper-salivation. A great idea to get the best out of your chop is to skewer and stand the fat side down for crisping and sealing. Remove the skewers, add a squeeze of lemon juice and braai as normal (the lemon acts as a tenderizer and enhances the meat flavor). Although some may regard chicken as a vegetable, it is actually a lean white meat that can offer a succulent, scrumptious meal. Chicken takes the longest so keep it over moderate coals and unlike steak, you will need to turn chicken regularly. For added flavor, use a rosemary branch instead of a brush to baste the chicken. Bangers or chipolatas, you can get a sausage in practically any meat and size. But, a braai isn’t really a braai without the boerewors. Literally translated to farmer’s sausage, and affectionately known as boerie, this sausage is a special mix of meat, and spice with varying versions. Sosaties are another meat braai idea that allows you to combine any type of meat and veg that you want making these meaty braai ideas perfect companions for any meat feast. To infuse extra flavor into a sosatie, replace the wooden skewers with a rosemary branch. Beef or pork ribs are a lip-smacking treat but easy to burn the marinade. To prevent this, parboil the ribs with peppercorns and bay leaves. Marinade and allow to rest before adding it the hot braai. Although rashers are considered more a bacon starter, pork belly offers a full-bodied indulgence as different meat braai ideas. Immersed with exotic seasoning, you can embellish with this pork option. A thick, good cut of T-bone, sirloin, rump, or fillet are sure winners at any braai. The secret lies not only in the meat but in the quality of wood and coals. So, choose wisely. Lastly, know the braai order. Steak is the quickest so, leave the best for last.